Retracing the path of event (return to sender), passage and coming to pass. Why were the trading ships entering warmer waters, where they encountered teredo navalis? Look around from this moment to notice the current, the economy: we are in the spice trade. Pepper plants are native to India, and pepper has been used in Indian cuisine since ancient times. Pepper was so valuable that it was used as money. 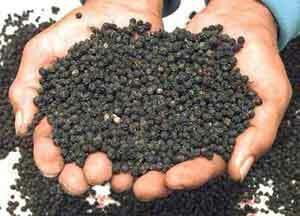 In its decline Rome paid "protection" to the Visigoths in the form of tons of black pepper. The "spice" trade was in fact primarily the "pepper" trade. Competition over control of the trade pushed the Portuguese to find a water route (alternative to the sea and land routes controlled by Venice). The story is familiar from there. The lesson of this history for fatal strategy is to trace the accident as Nemesis, but not so much in the ancient sense of retribution, but in the more immanent sense of "tribute." We reached for spice, and got dioxin. The accident records our gesture, creating a field of action around Flesh, that is, human embodiment. People developed a passion for the pungency of pepper. The account of pepper as a preservative apparently is not accurate. It was rather flavor that sent the accident, precisely: taste. This particular event is exemplary in part because of its association with Kant's Critique of Judgment, and the foundation of electracy on the sense of taste, the sensorium oriented by pleasure-pain. Check your event for its bit of Flesh (Merleau-Ponty's alternative to "substance"). Here is the passage of pleasure to which wisdom devoted most of its attention. What is the wisdom of pepper?